Prolific marketing blogger and author Seth Godin writes: [if you employ knowledge workers] it’s hard for me to see why you’d bother having someone come all the way to an office just to sit in a cube and type. He also comments don’t bother showing up if you’re just going to sit quietly. He’s right – space is expensive. Home working is cheaper. 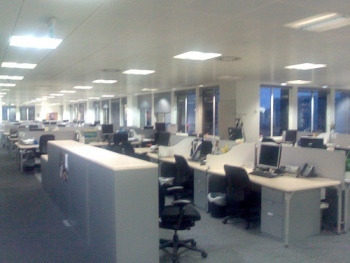 So if you are a knowledge worker like us Planners and are planning on showing up to work at the actual office when most of the point of being there is to be doing lots of collaborative, creative stuff with your colleagues – why do most agency offices mainly consist of a sea of desks? I don’t think that introducing hotdesking to make room for more sofas and beanbags is the answer. On friend who has tried it describes it as ‘lukewarm desking’ when everyone ended up sitting at the same place day after day and latecomers got the dodgy desk near the photocopier. My place are quite good about encouraging us to work from home if we need some peace and quiet (we’re so rammed in here that the latest space saving idea is – smaller desks) but we haven’t quite cracked the space-to-work-together challenge yet. It comes back to Creative Spaces – the function of an office should be about engendering co-operation and creative thinking. Not the soundtrack of laptops being attacked in a two finger gallop. Working from home is under rated. It definitely allows for people to get the peace and quite they need to get the jobs done. Emails alone (although a marvelous invention) interrupt home workers enough far less other colleagues. Offices should absolutely be about creating a buzz!